FIIB's 24 years of continued association testifies the confidence of industry in us as credible growth partners. Our 2200+ strong alumni spread across continents and companies have been capable contributors as employees as well as entrepreneurs. As the name suggests, our Career Management Centre is much more than a Placement Office. Our mission is to build bridges between the corporate world and the academic stakeholders and facilitate developing a stream of employable management graduates. We work with our students for career preparation and connect our alumni for leadership development and placements. 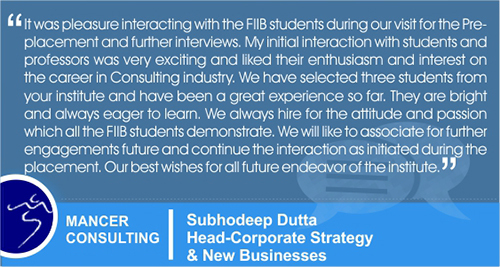 Graduates of all domains from Delhi-NCR and other geographical regions choose to come to FIIB for the learning rigor and focused faculty attention. We placed about 95% graduates with at least one offer in the summer of 2016, while 100% graduates were placed with at least one offer in the summer of 2015. 100% of our students have been successfully placed for internships year after year. We thank our industry patrons for collaborating with us in transitioning students from campus -to - corporate world!